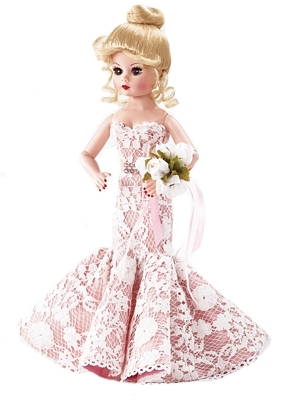 This beautiful fully articulated 10" Cissette, blonde and blue eyed, is dressed in a beautiful mermaid style gown of ivory lace with a blush pink under layer. A blush pink belt with rhinestones and gold sandals complete the look. With her ivory tulle veil, rhinestone drop earrings, garter and bouquet, she is a bridal vision.